The Irish Government continues to impose the draconian Vehicle Registration Tax on new and second-hand vehicles brought into the State, however MAG Ireland has recently learned that the EU Commission is now investigating the way in which the Irish Government applies VRT. 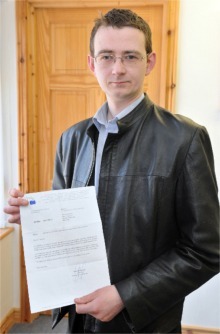 This investigation has been prompted by Donegal man Ryan Stewart, who made a petition to the European Parliament in relation to the way freedom of movement rights conferred by the EU are infringed by the application of V.R.T. legislation here in Ireland. Ryan wrote to the Brussels-based EU Committee on Petitions claiming that two groups of Irish citizens – students from the Republic who drive to colleges in the North and cross-border workers – were having their human rights infringed by the way in which VRT legislation is applied in the Republic. The legislation allows for the seizing of vehicles that do not have Irish number plates. This is irrespective of whether you live in the North or the South and infringes the right to travel and work within the E.U. Thanks to Ryan’s intervention, the EU commission examined the situation, and has now instituted infringement proceedings under article 258 of the Treaty on the Functioning of the European Union. “I believe this decision by the European Commission is a just and fair decision as certain categories of persons are put in an impossible situation with their freedom of movement restricted by the current application of Vehicle Registration Tax law”. Of course there have been many previous challenges to VRT, and the response from the EU has always been that it’s a matter for the individual member state, much to the fury of Irish riders and drivers alike. The difference this time is that the way in which the VRT legislation is applied may be found to be in contravention of Article 258 because it potentially criminalises Irish students who drive to colleges in the North and cross-border workers living in Northern Ireland but working in the Republic. Now it seems a court will decide and the outcome of this case may change the way in which VRT is applied in this country. MAG Ireland congratulates Ryan on his success thus far. His tenacity and determination serve as a reminder to us as riders that regardless of how many anti-bike proposals we face, there is always a way forward.